Former England limited-overs head coach Ashley Giles has backed Eoin Morgan to emerge from his batting slump after yet another failure against Australia. Skipper Morgan was dismissed for a six-ball duck in England’s 111-run defeat to Australia in their World Cup opener at the MCG on Saturday, to record a second successive one-day international no-score and a third in a row against the Australians. Irishman Morgan has four ducks in his last eight ODIs, although he has scored a century, against Australia, in that sequence. 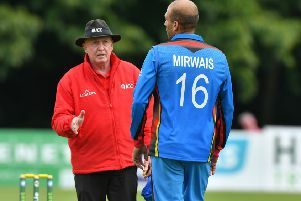 His latest failure with the bat prompted criticism from Geoffrey Boycott but Giles, who coached England’s Twenty20 and one-day international teams between 2012 and 2014, believes Morgan will come good soon enough. “He’s finding all sorts of different ways to get out,” Giles told BBC Radio 5 Live’s Sportsweek programme. “Yesterday’s dismissal was quite an odd one - trying to pull off the end of the bat and getting caught behind - but I’m pretty confident that Morgs can come through that. “We need him to as well. We need all the senior players, as he said after the match yesterday, to really stand up and start taking some responsibility.